The renewal of the MBA curriculum follows current trends and developments in today’s business. The new course “Digital Transformation” brings a cutting edge to the third semester. New marketing electives include “Digital Marketing” and “Communication Management - Public Relations”. In the field of finance, new courses “Mergers, Acquisitions and Corporate Restructurings”, “Applied Corporate Valuation” as well as “Capital Raising and Investing” enhance the course catalogue. 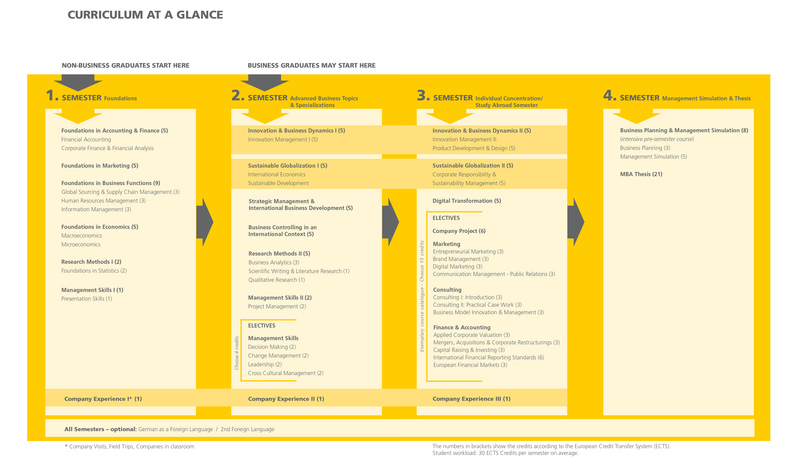 Additionally, selected courses have been shifted between the semesters to balance the MBA journey. Apart from new and restructured courses, the MBA program upholds the successful two-pillar structure of a classical management education in combination with the contemporary topics of Innovation and Sustainable Globalization. After a set of “Foundations in Business Topics” in the first semester, students specialize their learning through electives. The second semester provides electives in Management Skills, while the third semester offers a broad range of courses from Marketing, Consulting, as well as Accounting and Finance. Furthermore, company experience is an integral part of our curriculum to ensure a practically-oriented learning experience through company visits, field trips and guests in classroom. The opportunity to learn German at the university will continue to be offered in addition to the MBA courses. "Exciting new opportunities and more choices"
“Our revised curriculum is a very good mixture of continuation and of curriculum innovation. Substantial parts of our well-established courses remain unchanged while new courses focus on important fields of today’s business. It offers our students exciting new opportunities and more choices” says Professor Harald Strotmann, Program Director of the MBA program and Vice Dean of Pforzheim Business School. The new curriculum is put into practice from October 2018.